His Excellency, President for Life, Field Marshal Al Hadji Doctor Idi Amin Dada, VC, DSO, MC, Conqueror of the British Empire in Africa in General and Uganda in Particular was a criminal military leader and President of Uganda from 1971 to 1979. Amin joined the British colonial regiment, the King's African Rifles in 1946. 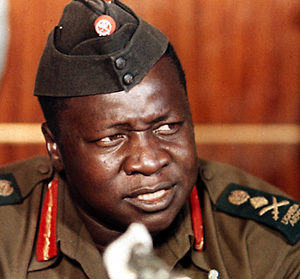 Eventually he held the rank of Major General in the post-colonial Ugandan Army and became its Commander before seizing power in the military coup of January 1971, deposing Milton Obote. He later promoted himself to Field Marshal while he was the head of state. Amin's rule was characterized by gross human rights abuse, political repression, ethnic persecution, extrajudicial killings, nepotism, corruption, and gross economic mismanagement. The number of people killed as a result of his regime is estimated by international observers and human rights groups to range from 100,000 to 500,000. During his years in power, Amin shifted in allegiance from being a pro-Western ruler enjoying considerable Israeli support to being later backed by Libya's Muammar al-Gaddafi as well as the Soviet Union and East Germany. In 1975�1976, Amin became the Chairman of the Organisation of African Unity, a pan-Africanist group designed to promote solidarity of the African states. During the 1977�1979 period, Uganda was appointed to the United Nations Commission on Human Rights. In 1977, after the last two British diplomats withdrew from Uganda, Amin declared he had beaten the British and added "CBE", for "Conqueror of the British Empire," to his title. Radio Uganda then announced his entire title: "His Excellency President for Life, Field Marshal Alhaji Dr. Idi Amin Dada, VC, DSO, MC, CBE." Dissent within Uganda and Amin's attempt to annex the Kagera province of Tanzania in 1978 led to the Uganda�Tanzania War and the demise of his regime. Amin later fled to exile in Libya and Saudi Arabia until his death on 16 August 2003. I propose getting rid of conventional armaments and replacing them with reasonably priced hydrogen bombs that would be distributed equally throughout the world.